1. You were born an Auburn fan. Fate and choice conspired to burden your days with this nonsense. Worse fates? Yes, there are worse fates and worse choices to be made. As an Auburn fan, you believe a worse fate would have been being born an Alabama fan. But if you were born an Alabama fan you would believe there was never a birth defect more horrible than being born an Auburn fan. And, being an Alabama fan, you would be right. There are few chosen (chosen?) maladies worse in the state of Alabama than being born an Auburn fan. You don’t believe in predestination but yet you must admit the events and paths (left-not right and right-not left) taken have led you to here. What does that mean? You could have chosen otherwise, but you didn’t. Should’ve? Didn’t. So you were born an Auburn fan. 2. 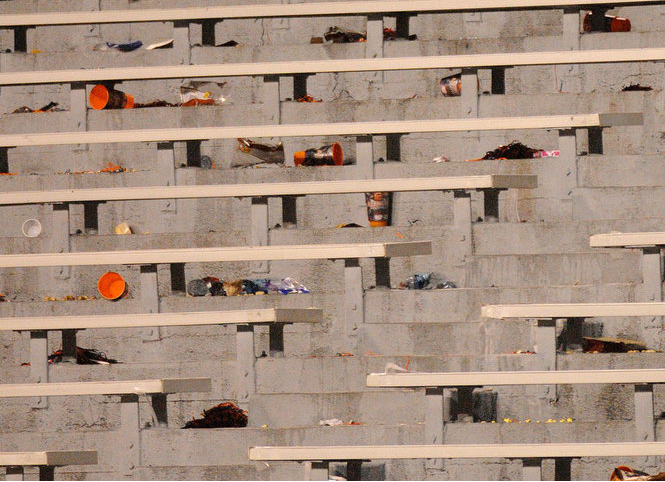 You secretly believe the most interesting and most enjoyable facet of Auburn fandom is the ever-present martyrdom. Your innards smile with wry glee when an Alabama fan mentions 14 or Nick Saban and his continued compensating march of personal doom. You are like an early Christian in Rome. But these gladiatorial pits are Cracker Barrel and Jim’s Barber Shop and the lions are jolly and bitter retired men of 60+. “Hey [you]. Hey, what happened to you Barn fans? I thought ya’ll were All In.” And they hack with laughter. You act mad. Are you mad? You might feel actual anger. The frustration of impotence perhaps. But later, when you’re alone in your car or lying beside your wife, a quick smile will appear, and you will comfort yourself with the incandescent truth and beauty of your personal Auburn love. 3. You dream of yourself strapped to a metal chair in an otherwise empty room. You are shirtless. Your expansive stomach and your rug of chest hair are missing. You look a lot like Daniel Craig, but you recognize yourself in the chair. It’s definitely you in that chair. Your inner you. You cannot recall why you are strapped shirtless to a metal chair in an otherwise empty room. The floor is striped with alternating light and shadow. (Picture one of those third-world jails movie people enjoy so much.) Through the chiaroscuro, in the furthest darkest corner, you hallucinate a large grayish lump. In walk two men. They wear boots and their boots make boot noises on the concrete floor. They wear what might be leather suits that might be as dark as dried blood. You cannot see. You are weak with stupidity. They have German accents. Imagine their German accents. The shorter of the two slaps you with a pork sandwich from Dreamland. The other breaks a Bear Bryant commemorative Coke bottle over your head. “No,” you say, delirious. You are still answering the first question. The hallucinated grayish lump moves. Its feet make no sound on the concrete floor. You watch it approach in strobic instances. Each section of light allows a clearer image. It is Big Al. Big Al holds a bag. It is a black bag. Big Al raises the black bag. Your eyes are wild and you might vomit. As the bag lowers you yell, “War Eagle! Cam Newton War Eagle Bo Jackson go to hell Alabama six fingers No No No I won’t do it No War—” Your screams are muffled by the bag. You thrash but the suited men hold your arms. You smell burnt hair. You faint. 4. You wake from dreams and there is a faint ache near what you believe to be your appendix. You like your appendix, but you are unsure of your appendix’s purpose. Worried and nervous, you consult the internet. The first 45 Google hits suggest immediate removal, for the pain will only increase and death can and will follow. The internet is sure you will die any second. For reasons unclear, 70-75% of the internet are cheering for your demise. More rational portions of the internet warn of the high price of emergency appendix removal. Several sites suggest taking the gallbladder instead. More suggest excising both appendix and gallbladder. Numerous sites even suggest a removal of the entire lower abdomen. Apathetic sections of the internet are reluctant to comment on invasive surgery and instead laugh at your pained expressions. The ache increases. It is 10 a.m. You cannot decide if you are dying or if you need to evacuate a healthy load of resilient waste. 5. You now realize the world never stops. The movements of yesterday only have a tangential relationship to tomorrow. Two years is a long time in our world. Names are forgotten. Nature decays, rebirths, burns, rises. Old leave, young arrive. You try to accept this flow and flux without undue hem and haw. You do. But it’s not as if the movement cares about your personal frettings. You ask what lasts. You ask this to each situation and person you encounter. You don’t ask ask. No. You sit and watch and hope it will be revealed. All you see is movement. See, you must decide to believe in the primacy of history. Whatever that means. The problem with history is that history is sometimes not enjoyable to remember, not the totality of history. Alabama has beaten Auburn more times than Auburn has beaten Alabama. 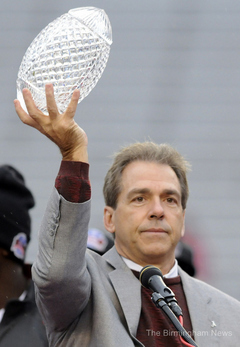 Alabama claims its 14 national championships. Auburn claims its 2. You cannot change history. Sometimes this makes you angry and you type mean words on the internet to people very much like yourself (your twins even), and they respond with equally mean words. You both feel like winners. This is pretty funny. You would admit this on odd days. Mostly you are convinced of your superior personal worth. History guffaws and your team loses every SEC game. A hero emerges and your enemy is defeated. You will rise again. Then you will fall. And again it plays. You are too deep inside to realize how silly this is. You know this to be unfair and stupid. 6. You would believe in Family if you could. The concept of solidarity is appealing. You even believe solidarity necessary. The opposition outnumbers. Family huddles and clutches its tenets of Not Them. The defenses and rallyings often flail wide. They often swing at invisible monsters. But the love and rage of an underdog needs some direction. You would believe in the individual only. But you have begun to realize where that leads. You are wary of groups. You’ve only ever been a fringe member of groups. You’re not sure you want to be a part of any group that would have you as a member. You orient yourself in purposeful defiance. This is why you cannot believe in Family. 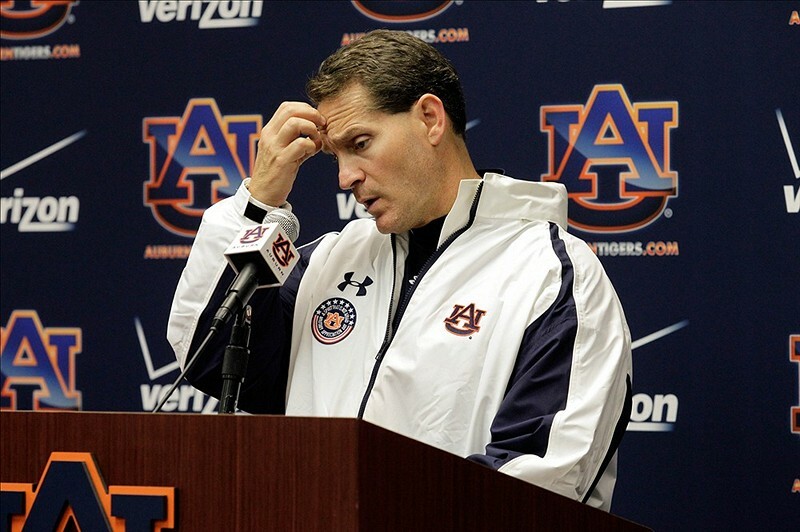 The Gene Chizik that left Auburn for Texas after the 2004 season. The Gene Chizik that is 5-19 as a head coach at Iowa State. The Gene Chizik whose Iowa State team lost its last 10 games of the 2008 season and went 0-8 in the Big 12 without even playing Texas Tech, Oklahoma, or Texas. I have tried to be very Zen about this whole circus/ blind circle jerk of ineptitude rumored to be a coaching search. But that was when I still had hope a large rabbit was going to be pulled from Jay Jacob’s hat and paraded in front of the vultures of the Alabama media as the savior of Auburn football. Gene Chizik is not a rabbit. He is a one-legged hamster that spends most of his day running in his stationary wheel and the rest sleeping in his own excrement. He smells bad and has no friends. Perhaps two or three years from now we will look back and consider this to be a great hire. Auburn’s first step in a new direction. I hope so. Because right now, it certainly feels like someone (Jay Jacobs methinks) has made a grave mistake. Two years ago you would have laughed at this person and said he or she was an unintelligent man or woman incapable of faith in institutions or organizations larger than his or her insignificant self. But you of course know nothing is ever finished and what seems right today is tomorrow’s greatest wrong. You guess the two participants seated one row behind you to be an aunt and niece discussing the niece’s stated interest in attending Auburn. You can’t see the aunt, but you imagine she smiles a big wolf grin full of joy at her niece’s naivety combined with vague spreading tendrils of remembrance reminding her of personal youthful love and folly. 9. You, for some reason, refuse to cease belief in the powers of hope and optimism. 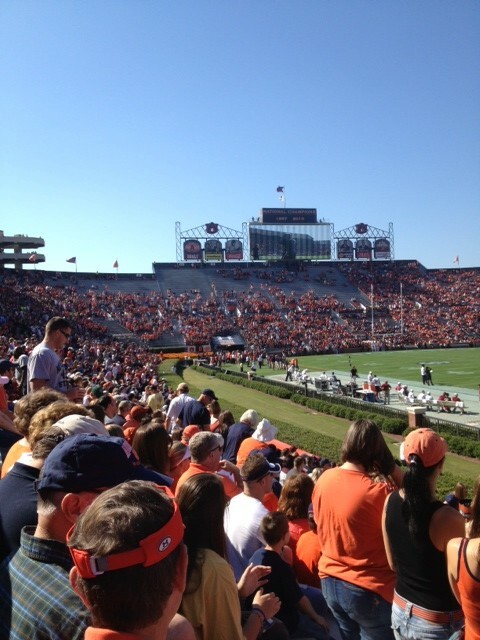 For this reason you attend the Texas A&M-Auburn game. Beside you, to your right, sits a young man in a zippable white sweatshirt. He is thick of build and face and his blond hair covers his ears and neck like a skirt. His face is blemished. He hunches. He later tells you he broke another boy’s collarbone with a football tackle the day before. He never tells you his name. But he does tell you he is an Alabama fan. You ask why he is sitting beside you watching Texas A&M and Auburn. He says his friend and teammate (seated to his right) offered him a ticket. “I’d like to be in Tuscaloosa right now tell you the truth. It’s much more fun in Tuscaloosa.” He tells you he’s been out the last three nights rolling houses in the North Alabama town in which he lives. He inserts a wad of dip, wintergreen. He spits into an empty bottle. Early in the first quarter you realize you should not have talked so much to this young man beside you. Every Texas A&M big play or touchdown he says, “Johnny Football” to the sky. Sometimes he says it real slow, with a space between Johnny and Football, as the play develops. “Johnny [touchdown] Football.” A feeling that could and perhaps should be anger instead manifests itself as resignation. You remind yourself he did break a boy’s collarbone with a football tackle the day before. You shake his hand on your way out of the stadium at halftime. 10. You watched multiple losses at various restaurant bars. You sat alternately brooding and laughing at the earnest spectacle. When you brooded, the patrons left and right laughed and laughed heartily. When you laughed, the scattered servers and bartenders scowled. You cannot regulate. You are reminded of the words of a dead Frenchman concerning two dead Greeks. Democritus and Heraclitus were two philosophers, of whom the first, finding the human state vain and ridiculous, never appeared in public except with a mocking and ribald expression. Heraclitus, on the other hand, felt pity and compassion for this state of ours, so his expression was always melancholy and his eyes full of tears. If choice becomes necessity, you choose laughter. For, around the third quarter of the Arkansas game, the ineptitude became absurd. The only reasonable reaction was laughter. You must defend yourself against these horrors. Haha! But the echo chamber that is your thought resounds with the hollow rebound of fleeing laughter as you remember: Alabama will somehow win another national championship. And you remember: I lied to a loved one yesterday. You remember your own inabilities, presumed faults and lacks, prideful falls. Your backstabbing mind flashes a picture of your beloved first dog tongue out, dead. You look down and see a cracked rivulet of mustard staining your pants. The concrete beneath your aching feet is rent, broken. You trip and stumble and the sun burns. A woman without teeth and with eyes sunk into flesh discolored a rotten apple purple holds half a styrofoam cup aloft toward your penniless view. The streets writhe from selfish feet. You would laugh but your throat is clogged with sick. The whirling variety transforms into a distressed ashy grey. And there is certainly no relief or comfort in Auburn football. 11. You are unsure if this is a test. Is this the wilderness? Are we forsaken? Do we depose Moses two years after he led us into the desert? 12. You, mainly, wish you could care less. You wish the word fair meant everything happened the way you imagine everything happening in your head when you’re alone in your bed. But neither nor and your main source of athletically-inclined pleasure is cheering for teams ranked above Alabama not to lose. Or cheering for Alabama to lose. You would be one of those healthy-minded Auburn fans who wishes Alabama well when Alabama is not playing Auburn, but your world is a-jumble with paradoxical moral and social dualities, multiplicities, trigonometries and every choice in life is accompanied by a cacophony of voices suggesting and chiding and you just want Alabama to lose at everything. Everything. Church coed softball. Debate team. Twitter followers. University Dining. All of it. Just be bad at it all. You wonder if this is an undiagnosed mental illness. What is Auburn without Alabama? What is Alabama without Auburn? You do of course remember the Years of the Mikes and the Counting of Fingers. But time continues forward and the past can never outpace the present rush into the future. You and we are sunk in a need for every day to be a different yet exact reminder of the day before. It would certainly be easier and less mentally painful to deny this nonsense and move into the mountains with your goats and your packets of seeds. But then you hope life is not about (a silly string of words) not about what is easiest and most pleasurable. Related: Again, and Again, and Again. You definitely moved into the deep water on this one. Some of it was really random, but way too much of it was right from my own heart, as much as I hate to admit it. Like you said, I wish I did not care so much, and I especially wish I was not so bothered by the success of our rival. Hate is a bad word, but it is very much real! Did Moses get too much credit for the work of his OC? We shouldn’t have let Joshua walk out on us then. What did the burning trees say to Moses?? I started out not enjoying this. It seemed to say to me that Auburn is only about beating Alabama and that is a futile task, that we will always be the little brother. Some Auburn fans, when they get you alone and they don’t think anyone will overhear them, will confess to you that this is how they feel, this is what they believe and this is what makes up the majority of their fandom. I have never bought into that school of thought about Auburn and Alabama. In my mind, because in all actuality in my lifetime, Auburn has beaten Alabama more times than Alabama has beaten Auburn, Auburn has more undefeated seasons than Alabama, and were it not for media boas anda flawed system Auburn might have just as many National Championships as Alabama. In my mind and in the 30 years I have been living Auburn is very much Alabama’s equal and is that much better because we compete and win despite the deck being stacked against us. We are the Rocky of college football. All the more reason to play Eye of the Tiger on gameday. But as I read on I enjoyed and identified with your writing more and more. This season has been insufferable and just keeps getting worse. Taking my packets of seeds into the hills is something that has crossed my mind often this year. But for whatever reason I love Auburn too much. True story and perfect illustration: yesterday when the story came out about NCAA investigations, I was so mad that I started to take my Auburn hoodie off. But then I realized it would do no good because the t-shirt I was wearing underneath was an Auburn shirt too. That has been this season for me in a nutshell. 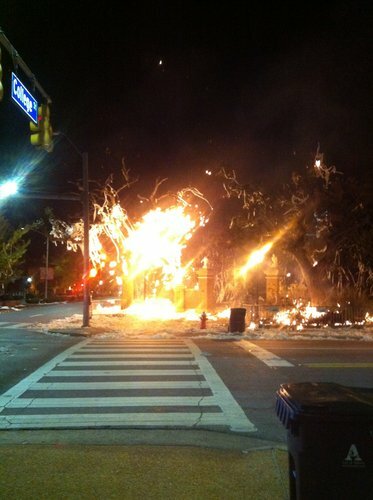 As much as I feel like I don’t deserve to be put through this, I am Auburn even though sometimes it is hard to love it. I also love Chizik being described as a one legged hamster when we all expected a big white rabbit. Who among us did not try to figure some way that Auburn could make Malzahn the HC without Auburn having to go through something like what this season has been. 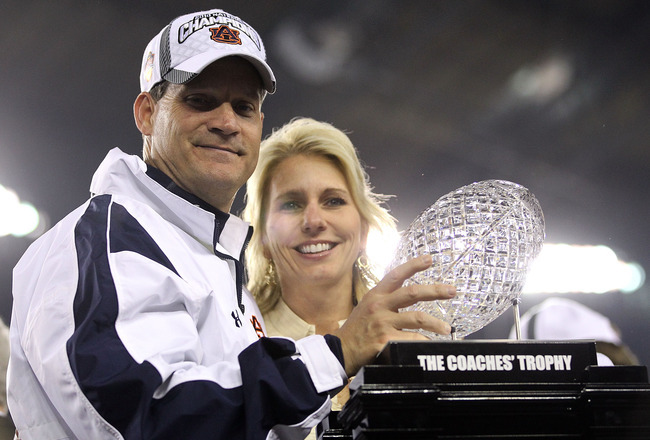 I just hope he has more of an appreciation for discipline than Chizik has shown. Thank you for once again tapping into the Auburn subconscious. I enjoyed reading the Johnny Football part and thinking about him beating the Tied. I then remembered, of course, that, at least for now, it doesn’t matter.